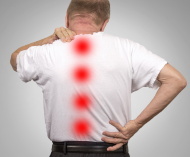 Back pain can be a result of various disorders that include structural problems, acquired conditions, sprains and fractures and any of these disorders may lead you to consider treating your back pain by having surgery. There are several back pain treatment options available, including back pain operations, and the doctors will recommend treatment depending on the nature and severity of your problem. In some cases, non-surgical back pain treatments like physical therapy and chiropractic care may be an option to reduce or manage your back pain.